I am starting a series, similar to the last two posts, looking at the highs and lows bacteria reported by Ian Lipkin — and what can be done to correct them. As always, I will be using publications on PubMed to list the research followed by my Bottom Line summary for the brain fogged. I will be looking at supplements, probiotics and food only — antibiotics are likely to be more harmful then helpful when we are dealing with this type of fine re-adjustment of the microbiome. I will do one bacteria at a time. It is important to note that his results were based on the average. In reality, individuals may be all over the place. Once CFS person may be normal for one family and the next one very abnormal. The model is that of a shift of the microbiome. The shifts will not be identical in everyone because every one’s microbiome is unique when healthy (more distinct than a fingerprint!). His 2017 paper is available here. 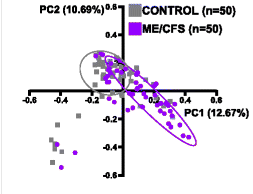 This chart from the paper show some controls and some cfs with the almost the same values, and some with a major shift. You cannot apply one size fit all treatment (for example the high Blautia issue in my last post impacted just 3 of 20 CFS uBiome results that I have looked at, 15%). Getting uBiome results (or equivalent) is likely helpful — whatever test you use, should measure hundreds of families. I have taken the liberty of copying the table from the article below (so I may link from their findings over the next month). researchers have a sounding board for their hypothesis and proposals; ideally with trials of items suggested and seeing what the shift in the microbiome (if any) that results. Special thanks to L.L.Ingram for encouraging me to undertake this epic project.